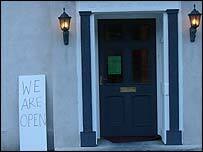 A Cornwall village devastated by floods last August has had a May Day celebration to mark its recovery. 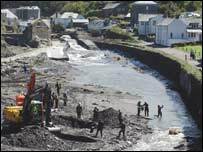 Boscastle was flooded when a 10ft (3 metre) wall of water crashed through it after 3in (77mm) of rain fell in just two hours on 16 August last year. About 300 people were entertained at the harbour side on Sunday. Local traders hope the festival will encourage tourists to return to the village by showing that nearly all the affected businesses have reopened. More than 100 village children and members of the parish council paraded to the newly-reopened harbour dressed in sea-themed costumes with a live samba band. Shops were decorated in bunting and fresh flowers, and a ribbon-cutting ceremony pronounced the newly refitted and restocked village shops open. Boscastle's vicar, the Rev Christine Musser, then led a harbour side service, with fire-eaters, jugglers and folk singers to entertain the 300 locals and holidaymakers. Ms Musser said: "It's very upbeat. The sun is shining. There's a lot of people here, a lot of smiling faces. "It's been a difficult few months, it's been a long haul and there's still a lot to do but this is a really positive day for everyone here. "It's a turning point. It's onwards and upwards from here." She added: "We know we live in a beautiful place with lovely people and that we have a lot to be thankful for that no lives were lost last August and that a lot of re-building is going on and there's lots more that we can do in Boscastle." Melody Larratt, 31, grew up in Boscastle, and lives nearby. Her mother's house was damaged in the floods and her car was swept to sea. Miss Larratt, who was at the festival with her eight-year-old daughter, Faye, said: "I think it's the beginning of summer and it's nice that the village has reopened. "It's not completely there yet but they are getting there. It's a very positive atmosphere." Damage costing millions of pounds was caused by the disaster on 16 August. An estimated 440m gallons of water tore through Boscastle and military helicopters airlifted about 80 people to safety, some of whom clambered on rooftops to flee the water.